Modern Day Heroes Living Within Us…..
What is a hero? The dictionary describes a hero as a person noted for feats of courage or nobility of purpose, especially one who has risked or sacrificed his or her life for a great cause. But anyone can be a hero within the eyes of other people. For me a hero is someone who inspires people in doing small or great things for the benefit of a few or many without considering monetary concerns. From the eyes of the child, their father could be their hero. From the eyes of the wife, their husband could be their hero. In this modern society, heroes live within us. Two children drowned in the pool. Both were brothers, aged 7 & 8 years old. They were in the pool area with other kids playing. The elder brother was eating and was a bit close to the edge of the pool about 5 feet deep when suddenly was bumped by a child who was running around the area with other kids. He fell into the water and struggled to swim back to the side of the pool. He got tired and drowned. His 7 year old brother came to his brother’s aid but to no avail and likewise drowned. No one noticed the incident until a guy went in for a dip in the water and noticed that he felt something under. It was the 8 year old boy, lifeless lying flat under the pool. He pulled out the kid and called for medical assistance. It was at this moment that people in the area started gathering at the scene. 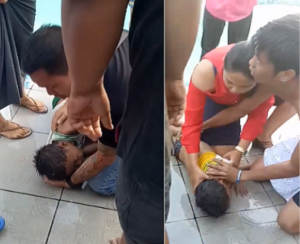 The other child was still in the water and was only pulled out when one staff of the area saw the child lying flat on the pool as the rest of the people were already focused on the first victim. Both children were lifeless and it could not be determined as to how long they were underwater. Reavo Members were at the area attending a double birthday celebration. Was celebrating her birthday as well as her son (double celebration). Prior to the arrival of the medical personnel our heroes provided the most important thing that anyone can do… CPR. REAVO CEBU, and REAVO Members Harvey “Harvs/Harvski” De la Victoria and Wendy Mirambel. I did my initial assessment on my patient (8 year old victim). Airway is blocked due to too much food intake. There was no breathing and no pulse as well. I cleared the food content that was obstructing the child’s mouth and proceeded to CPR. After about 30 compressions, my patient gagged and vomited so I placed my patient to recovery position to remove the rest of the food contents to clear the airway. Once everything was cleared my patient became unconscious again and went back into respiratory and cardiac arrest. I reposition the victim to provide CPR again. Shortly after the my 2nd cycle the victim vomited and life was back. I did the same thing… placed the victim on recovery and cleared the remaining food contents in the mouth. Once again the patient went back into arrest and again I proceed with another 30 compressions to which my patient recovered again. This time, it was all well. Upon placing him on recovery position, the patient recovered slowly. I noticed continues breathing and pulse present. I never left my patient until he regained his energy. After several minutes while he regained his energy, he vomited in a projectile manner the water that he ingested from the pool. Wendy provided compressions on the child (7 years old) while a family member of her provided rescue breath. They went through all the assessment of the boy until they saw signs of life. A total of 2 cycles of CPR were provided and shortly thereafter the victim recovered. We then turned over the patients to the responding ambulance personnel. We made a follow up on the patients and both of them completely recovered with no brain damage. For sure without the care provided, the victims may have not survived. We can see a lot of videos posted online were people provide the wrong care and naturally we can see the consequences of such actions. We certainly hope that more and more people will learn the right way of providing Basic Life Support so that when the moment comes, a bigger chance of survival is attained. HARVEY “Harvs/Harvski” DE LA VICTORIA is 29 years old from Mandaue City. 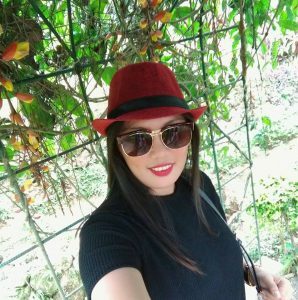 A nursing graduate and currently working as a Claims Officer in a Shared Services Company and does creative writing with Cebu Tours on the side line. 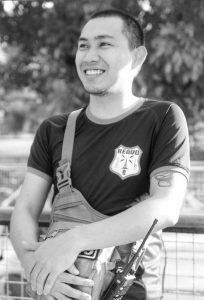 An active volunteer REAVO (Radio Emergency And Volunteer Organization) Cebu. Reavo Cebu is a private institution or group that had been serving the community for 3 years already. WENDY MIRAMBEL is a mother of 2 children. The birthday celebrant at the time of the incident. She works online as a General Virtual Assistant and at the same time works as the company secretary on their own business. Also a REAVO member inspired by her husband who have joined REAVO earlier. REAVO CEBU is a private institution organized about 3 years ago providing communication and emergency assistance in the locality. 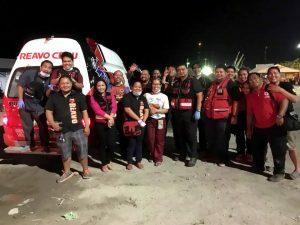 Currently the group has one ambulance and is active in civic work activities particularly in the emergency situations. Members of the unit are from different fields of profession and business. I am sure that there are people out there who does the same. We hope that your numbers will multiply and we salute all of you for making a difference in the lives of many, for saving lives, for being heroes in these modern days…. This entry was posted in News and Events on February 23, 2017 by basiclifesaving.